Far too often, art gets pushed to the side when it comes to school culture. But if you build your program the right way, the community you create in your room will help your kids succeed in so many ways. And people will undoubtedly notice. 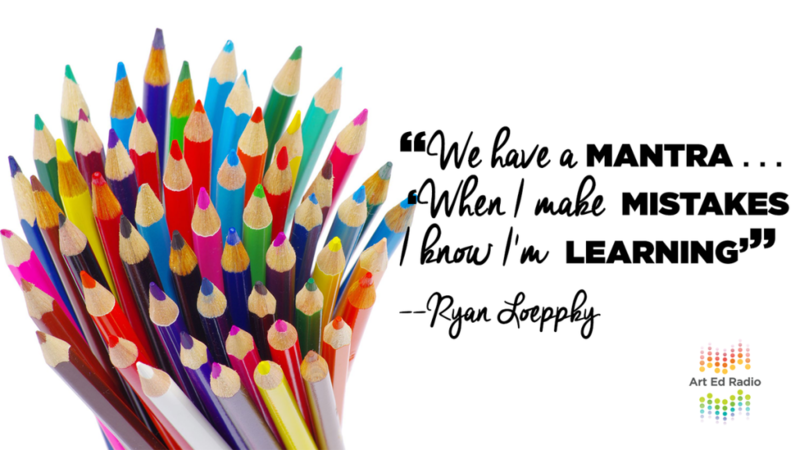 In this wide-ranging discussion, Tim talks to Ryan Loeppky about building an art room culture that gets noticed and shared (6:30), what we should be teaching kids (14:45), and why it is so important to make your kids’ work visible (18:30). Full episode transcript below. Welcome to Art Ed Radio, the podcast for art teachers. This show is produced by The Art of Education and I’m your host, Tim Bogatz. Today’s episode is going to be all about school culture or more specifically art room culture and how it can fit into the bigger picture of our schools. It’s no surprise that our kids push to the side far too often in our schools because let’s face it, we aren’t as visible as other programs. Hey, what we do isn’t out there. We’re not competing against anyone. We’re not putting our stuff on display on a regular basis and it’s tough for people to see what we do on a regular basis. But even then, even when we are putting our work out there, it’s not necessarily visible. It’s not easy for people to see what we are teaching or what our kids are learning or what they’re doing on a day to day basis in our classroom. 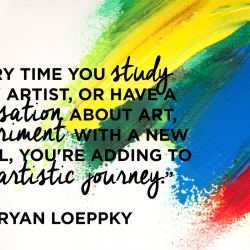 Because we all know art is about so much more than the end product and we’re teaching kids about creativity. We’re teaching them about problem solving. We’re teaching them about how to think or teaching them how to be better people and that doesn’t show up in a box score or at an academic competition or when something else happens. So when we do what we do to make our program more visible, hey, we want to make to make art part of the bigger picture in our schools. The question is how much time should we spend worrying about that? Because I personally a lot of introverted art teachers who are very happy to do what they do in relative anonymity. What they’re doing is best for their kids and they’re doing amazing things in their room and they couldn’t care less about how that’s seen in the rest of the building or in the rest of the school culture. So that’s an interesting thing to think about, like how do we want to put the word out there and how important is it for us to be respected throughout the school. Obviously that’s going to be different for every teacher but I think the idea as a whole is really interesting. I’ve been thinking about this a lot and I’ve been talking about it with a teacher named Ryan Loeppky who’s from Manitoba. We’ve been emailing back and forth, we’ve been talking back and forth about a lot of these ideas and I thought it would be worthwhile to have him come on the podcast and we can hash out some of these ideas together. So we’re going to talk about the cool things happening in his classroom. We’ll talk about those ideas about teaching, what we should be teaching our kids, the type of art making process, kids are going through, the learning environment we want to create and how all of those things together kind of translate into an art room culture that you’re proud to share and that you want to be part of the bigger picture in the school. Most importantly, we need to talk about what kids should be learning and why they should be learning in those ways. So I think it’s going to be a really wide ranging conversation. I think it’s something you’re going to enjoy and hopefully you can get some takeaways on exactly how you want to develop that learning environment in your classroom and what you want your kids to be taking away from your class and from your courses and from your program. But before we get to that conversation, I need to tell you about Art Ed PRO. 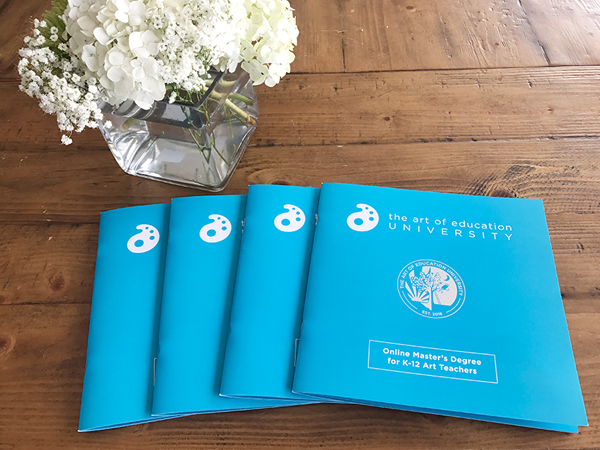 Now, as you probably know, Art Ed PRO is the subscription service for a professional art teachers offered by The Art of Ed. Earlier this month, we released three new learning packs, one on watercolor painting, one on color theory and one using games in the art room. All of them are great. All of them are really in depth. Each one of those three learning packs has between 15 and 20 videos and all of them also have about a dozen resources that you can print immediately and use in your classroom. PRO members get three new learning packs every single month and November 1st, you will get to see my beautiful face as I share all of my secrets for teaching art history and actually making it exciting at the secondary level. If my face doesn’t excite you which let’s be honest, why would it, there are also two other learning packs coming and they’re also going to be amazing. But PRO members also have 24/7 access to every learning pack in the library. So you can sign up for your 30-day free trial and check everything out at Artedpro.com. But before you go sign up, let’s bring on Ryan and get this interview started. I am here with Ryan Loeppky, art teacher extraordinaire from the Great White North up in Canada. Ryan, how are you? Ryan: I’m doing good, man. How are you? Tim: I am doing really well. Tim: So let’s just into our conversation here. I want to talk a little bit about how art kind of fits into the bigger picture in a school or how it’s part of the bigger school culture. Because I feel like something we’ve talked about is there’s so much emphasis in our school system on competition. It’s there in sports. It’s there in academics but not necessarily in art. So when we’re a part of that kind of culture, how do we get noticed as an art program or how do we get our kids noticed for the great work that they’re doing? Ryan: Yeah, and that’s a big question with a couple of different parts. So the part you were asking about how do we get into this bigger picture in the school, I think the art class and the art that the students make is it’s a beautiful visual literacy that thrives in art but it goes out into the classes. It goes out into the math class and the science class and ELA where this creative visual dialog happens. So I think there’s ways of getting out there into the school that if we don’t, if the art class doesn’t or if we don’t even have art in our schools, we lose out on that visual literacy. As far as how do we get noticed, that’s another big question. It can be things like going on Instagram and Twitter and hashtagging your class and making sure that you’re out there in the digital world but there’s a part of me that thinks that we should be growing inward than outward as a class community or as a school community. Tim: Yeah, I like that idea. Can you explain a little bit more about that inward versus outward idea or that dichotomy? I guess specifically looking at that a little bit more. If you want kids to be competitive, do they need to grow inward first before they’re ready to grow outward? If they are ready to grow outward, how competitive do you think we should make our subject? Ryan: Yeah, I think this grow inward and outward kind of thing is let’s foster the safe place for the students to be where they can grow or they can fail, safe place to learn and that’s growing the community inward or in themselves and growing the community in the art classroom. Then as we grow outward, that can be the community of the school, push out into the community that is the town or city that you might be in and then even moving out from there, “Hey, let’s start something that might be national or that spans oceans if need be or the world.” So I think it’s that idea that we foster the student, their creativity and then we grow out from there. As far as competition goes, actually, I don’t think there should be competition in the classroom. I think we have enough of it in our world that maybe we don’t need to have that in art. You have the bands going through the hallways and they’re walking through and getting everyone riled up and those things are great and maybe art should have a band. I don’t know. Maybe we should have this art band that goes through and like, “Yeah, we’re creative and awesome and we made you think differently or made you think it was something else differently.” But no, all seriousness, I think this idea of competition doesn’t need to necessarily be in the art class. I think there’s enough pressures in the world. If we grow that community where we have people in our classroom that are making mistakes together and encouraging each other and growing together, that’s that growing inward as a class and then grow outward, show the world what we’ve learned, what we’re doing, what we’re trying to say. Super important. Tim: Yeah, I like that. I actually want to dive in there a little bit more if you don’t mind. Just because I like the concept that you’re talking about with kids having that space to fail and a space to learn but I feel like that there’s always some kinds of obstacles to those ideas because those kids who are perfectionists I feel like are always going to be perfectionists. So you talked about those ideas with your kid of when I’m making mistakes, I’m learning. But how do you transfer more of those ideas and how do you change the mindset for those perfectionist kids when they’re in your classroom? 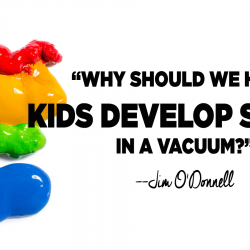 How do you develop the mindset that you want with your kids? If they see someone who’s crazy as me trying to do something, maybe, just maybe I can break down that barrier even a little bit for them to go, “No, that’s okay. Artwork is never finished. It’s kind of just abandoned or we move on or we do something new,” and we as humans are the same way. We are constantly trying to improve and we are, yeah, we’re in that same state of learning and so I want the kids that are perfectionists or comparing themselves to each other, I think I am a good example in the class of how things can go super bad. Tim: All right. So let’s talk about that a little bit more then. Once we’ve kind of broken down those barriers, even if it’s just a little bit, I guess my question would be what should we be teaching kids? 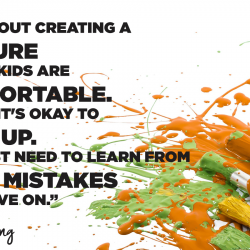 If you’ve given those spaces to process, to fail, to experiment, to learn and you’re showing them that it’s okay to make mistakes and we start to change their mindset but then where does it go from there? What is our end goal? What should we be teaching our kids? Ryan: Well, this is something I’ve been working through basically my whole life. I grew up in a community and in a school that didn’t have art from kindergarten to grade 9 and then when I went to high school, they didn’t have art there. So it was tough being in a culture where you didn’t have that … There wasn’t a lot to kind of foster this artist inside me or this creative person inside me. So I’ve kind of decided, “I got to change this, man.” So I’m actually teaching back in my own community. I’m teaching art. Ryan: Yeah, I’m really stoked about being back in there and doing that. But this end goal, the thing that I struggled with for so long, I kind of came up with this little title or little, yeah, a title I guess you’d say of what I want my students to leave high school with. It’s this idea of being an artful human. Just for instance, let’s say like my school division said, “Okay, you have to get, you have to produce so many artists.” If my job was solely to produce the $8 coffee drinking like I’ve got my warehouse studio artist, this is what I do full-time, I would be fired, right? I kind of struggled with it. Then where do I go from there? It’s this idea of being an artful human. This idea that we bring creativity and problem solving skills and resilience and all these beautiful things that come from art and we put that lens in front of us as we view the world, as we interact with the world, whether it’s in a job, whatever job you’re doing, you can put a creative edge to it. I give the example to my students that if you have a kid one day and they spill rice all over the floor, you can go, “What did you do?” Or sit down with them and start drawing in the rice. Obviously there’d be lessons later on about maybe not playing with a big giant Costco sized thing rice but maybe have some fun with that. It goes into all facets of life. Creativity is huge and so this idea of an artful human is for everyone. Nobody’s sitting on the bench. Everyone is doing. Everyone is contributing and being an artful human in their lives. Tim: Yeah, I like that a lot. I think that’s really well said. Tim: So one last question for you though, if we can talk a little bit about specifics, some takeaways for teachers who are listening to this. I know you do a lot of really cool things in your classroom to help kind of build that culture that you’ve been talking about, from putting art up everywhere to creating murals, working on collaboration with gallery spaces. Can you talk a little bit about some of those specifics but then also why you think it’s so important to get your kids’ work visible and what it does for your kids and for your program? Ryan: Yeah, okay. So some of the things that I try to do is I’ll try to get some people from the community into the classroom. So one of the fun things I do and I usually ask some of the students if their grandparents are close by or whatever, one of the things I do is I get some grandparents to come in and sit and usually this is at the end of the year and the students have to draw these people. Ryan: From life and, oh, the pressure is on. It’s like you could just see their eyes like, “No.” I’m like, “Yeah, we’re doing this.” It’s amazing the work you get when again, you’re working with other human beings, when you’re working with the community and I tell them, “What a way to celebrate somebody that has been in this community for so long and you’re capturing their likeness.” Then they go and walk around and actually look at the drawings and there’s a lot of pressure. But if you build that safety and you show that you can screw up as well and it’s okay, that the pride that goes into their work and the joy that they come away with when they create those portraits is unbelievable. That would be something where I’d bring the community in. One of the things I do to kind of say that art can go out into the world is we have a children’s hospital in large city near the school that I work at and this children’s hospital hoses a lot of families that are going through a wide range of struggles and so I try to tell the students, “You can’t just be stuck in this classroom. You got to go out.” So what’s a way that we can reach out to the community and so we started making art cards for these kids that are in the hospital. So we don’t write any names, we don’t write any messages. They’re beautifully anonymous and we send them out and these kids can pick really cool looking cards. Some of the are like Finding Dory and Star Wars and all these different things. Tim: Yes, that’s good PR for your program. Ryan: Yeah, yeah. Then there’s the digital world, right? The digital is big as well. Hashtag your school with art at the end of it. Make sure that you’re obviously asking students that you can show their work. But just the fact and our students are in a digital world. If you go, “Hey yo, can I take a picture of your … I like to put it up. I like to show other people what you’re doing.” That pride that go, “Okay, yeah. That would be great.” Some of them will be like, “It’s not even finished.” I’m like, “I know, it’s called learning.” Then they’re like, “Oh yeah, that’s right,” and then we keep on keeping on. So I would maybe those are some ways. I don’t have all the answers. I’m just trying to create. I’m just trying to get art into the school community, man. That’s what I’m trying to do. Tim: Yeah, and I think you’ve got some good ideas. Even if you say you don’t have all the answers, I think you have a ton of really good ideas. So I think that will be a good place for us to wrap it up. So Ryan, thank you very much for coming on to chat tonight. Ryan: Oh, it’s absolutely my pleasure. It’s been an honor being on here. Tim: I think that was a really good discussion and I’ve been we’ve been talking too long so I’m going to wrap it up quickly here. But just want to say we had a good conversation about all the cool things that are happening in Ryan’s classroom and I hope you’re able to take some ideas away from what he’s doing and bring them to your own classroom. More importantly, I hope this episode gives you a chance to reflect and a chance to think about what you’re really doing in your school, how are your teaching process, how are your teaching creativity when it comes to art making and how are you making your art department more visible, a more vital part of your school and how are you building an art room culture that you’re proud to share? Those are the questions that kind of came up in this discussion for me. I think it’s going to be worth your while to take a minute or two to reflect and see how you would answer them. Take a little bit of time to do that. Take a little bit of time to think, to reflect, to figure out exactly what you want, your culture and your art program to be. Spend some time on that and we’ll plan on seeing you next week. Thanks for joining me. 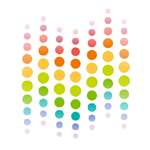 Art Ed Radio is produced by The Art of Education with audio engineering from Michael Crocker. Remember that you can sign up for our email list at artedradio.com. We always love to hear from you so send us your questions, comments, anything else you want to share at radio guys at theartofed.com.